Located in Milford and commissioned by a Lawn Tennis Promoter, this new purpose built Modular Building complex consisting of 5 No. 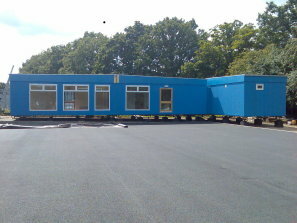 individually prefabricated modular bays provides a much needed Club House (136 sq. m) for their members. The design of this prefabricated building provides a generous seating area, male and female changing rooms complete with showers, toilets and an office. A fully compliant disabled toilet facility was also provided. Externally, the walls are finished with a blue resin based texture whilst the roof is constructed with our standard duo-pitch roofing system and hard wearing "Hypalon" blanket. Large picture windows were included within the lounge area to allow those relaxing to view the action on court. Internally, the walls and ceilings are finished with vinyl faced plasterboard and the internal doors are all solid core timber with closers and seals. The floors within the building are covered with hard wearing vinyl whilst the heating and hot water is provided by way of a gas fired boiler. An excellent Club House facility in which to relax after a tiring game of tennis!